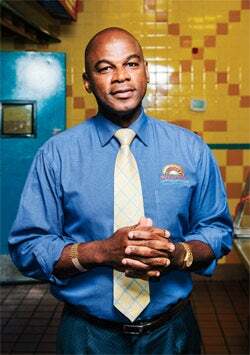 True to his roots: Lowell Hawthorne of Golden Krust Caribbean Bakery. It started with a family meeting. After 10 years in accounting at the New York Police Department, Lowell Hawthorne was proud that he and six brothers and sisters had made it in the U.S. after emigrating from Jamaica in the 1970s and '80s. But he also felt something was missing. He and his siblings had grown up in their parents' bakery in St. Andrew, making island specialties like hard-dough bread, ginger-flavored bulla cakes and coconut-filled gizzarda. That's why in 1989, Hawthorne presented his family with the idea of opening a Caribbean-style bakery in the Bronx. "It was a simple and modest concept to transport our father's bakery to us, and to supply folks craving this type of food in the Jamaican community," Hawthorne says. "Once we found a location, my sisters and brothers mortgaged their homes to the tune of $107,000 to start." Golden Krust Caribbean Bakery was an instant hit, and three years after that family meeting, the Hawthornes had opened nine stores in the tri-state area. By 1996, with 17 locations, they began looking into franchising. But Lowell realized that baked goods weren't enough. So Golden Krust added a full menu of Jamaican fast food, including U.S.-sanctioned staples like jerk chicken, but also more authentic offerings, like curry goat; ackee and saltfish; braised oxtail; and the most popular dish, patties, a pastry stuffed with ground beef, chicken, shrimp or vegetables. It was the right move -- Golden Krust is now the largest Caribbean-owned business in the U.S., with 120 stores in nine states and a wholesale division that sells sauces and frozen patties to Costco, 7-Eleven, Sam's Club and even the New York public school system. We asked Hawthorne about keeping the island spirit alive. Did you adapt your recipes for the U.S.? The recipes have evolved -- our hard-dough bread, for instance, is not as hard as you'll find in Jamaica. But we try to stay true with our patties and jerk chicken. We don't want to compromise quality, and we want to stay true to who we are. We make sure our scotch bonnet peppers, thyme and scallions are from Jamaica, to ensure farmers in Jamaica benefit from our success. You now have all 11 of your siblings in the U.S. What's it like working with family? When you operate a family business you have to work twice as hard. You have to capitalize on one another's strengths, and you have to bring in backup if one of your siblings is weak. Luckily, my siblings respect me a whole lot because I lead by example. Leadership is important--the way you lead is the way you are followed. My sons are in the business, and they're doing an extraordinary job. We have a succession plan in order, because at some point I want to step aside, though I will always be the visionary and chairman. How do you build U.S. awareness about Caribbean food? We've done blogs, Facebook and social marketing, and now we're advertising on television, billboards and buses in Florida. In the New York school system we're supplying 1 million New Yorkers with Golden Krust patties every month--that's really building awareness of our products. 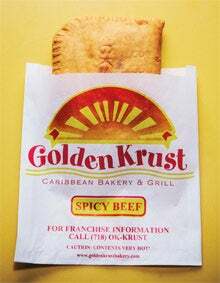 And we recently put up a large billboard in the airport in Jamaica, telling tourists leaving the country that the patties and products they enjoyed on vacation are available in Golden Krust locations in the U.S. And by Jan. 1 we're looking to establish a big flagship corporate store in midtown [Manhattan]. That will really raise our profile. How does philanthropy fit in? One of the reasons for our success is community involvement. Not only do we support local causes and farmers in Jamaica, we support the high school my siblings and I attended on the island, and we have awarded more than 150 college scholarships to high school students in the U.S. in communities where our stores are located. Do you think Jamaican patties will ever be as popular as tacos or Thai food? Golden Krust exists to take the taste of the Caribbean to the rest of the world. Wherever there are social gatherings, we try to supply them with complimentary cocktail patties and treats. I never pass up an opportunity to talk about our concept with speaking engagements or at franchise shows. It's part of a big vision we call our 2020 plan. Lots of products start in a core market and go mainstream, and we're doing the same. We have a mission to make our patties mainstream across the U.S. by 2020.